Rodeo tickets (which include hobbycraft entry) will be sold for $20 online and at the gate until sold out. . Once rodeo is sold out, there will be NO HOBBYCRAFT ONLY TICKETS SOLD as in the past. The Fall Rodeo will be every Sunday in October. Dates for the 2019 October Rodeos are 6th, 13th, 20th and 27th. Monday thru Friday, 9:00 a.m. - 3:30 p.m. When ordering by mail, payment must be either a Cashier's Check or Money Order made payable to Angola Prison Rodeo, or charged to a valid Visa, MasterCard, American Express or Discover . Credit cards are now accepted at the Ticket Booth on the day of the rodeo. Personal checks are not accepted for ticket purchases. NO REFUNDS ARE ALLOWED. Advanced tickets are only available for purchase from the Business Office at Louisiana State Penitentiary (LSP) after tickets go on sale. All seats are reserved. Anyone occupying a seat must have a ticket. Children 2 years old or under are admitted free if they are held by an adult. To purchase tickets using a credit card, you may purchase them online or call 225-655-2030, 2607, or 2008 . Upon receipt of your payment or credit card number, tickets can be mailed to you (if time permits) or can be held at a "Will Call" office at the ticket booth for pick up on the day of the rodeo. "Will Call' tickets must be picked up by the individual whose name is on the order. All tickets must be picked up at the same time. A Ticket Order Form is available for your convenience. Tickets remaining for each Sunday are sold at the ticket booth on the day of the rodeo. Prior purchase of tickets is recommended since many of the rodeos are sold out within one to two hours after the ticket booth opens at 9 AM. Shop for Angola merchandise online at the Angola Museum gift shop! By entering this penal institution, you have consented to a search of your person, property and vehicle. No food, drink, umbrellas, stadium seats, or cameras are allowed through the rodeo entrance gate. All weapons, ammunition, alcohol and drugs must be deposited at the Front Gate before entering the institution. All purses, diaper bags, belt pouches, etc., must be clear and no larger than 12”x6”x12” and will be searched before you enter the rodeo grounds. No food items or ice chests will be allowed. Ice chests must be locked inside the vehicle. All vehicles are to be locked. All knives, cell phones, cameras, or video equipment should be left inside your locked vehicle. All tools must be locked in a toolbox or inside the vehicle. Louisiana State Penitentiary is a smoke free facility. No smoking materials are allowed inside of the rodeo grounds. Inmate hobbycraft items are only for sale at Angola Prison Rodeo Events. Hobbycraft items for sale include: jewelry, leather craft, paintings and woodworking. Souvenir caps and T-shirts are also sold. 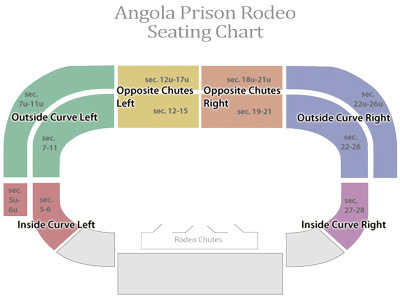 Several inmate bands perform (on an alternating schedule) before the rodeo, and the Angola Prison Rodeo Band performs during the entire rodeo starting at 2 p.m. Various concession stands are spread throughout the grounds. Some of the food items sold include: hamburgers, hot dogs, frito pies, sausage on a stick, pizza, po-boys, tacos & burritos, chicken nuggets, jambalaya, B-B-Q ribs, grilled chicken sandwiches, cracklins, boiled and roasted peanuts, baked potatoes, salads, fried shrimp, fried catfish, nachos, french fries, meat pies, onion rings, pastries, cotton candy, candy apples, ice cream, funnel cakes, snow cones, punch, coffee, soft drinks, bottled water, lemonade, and many more items. Sign up for special offers and announcements from the world-famous Angola Prison Rodeo, sent directly to you by email.